An example of Dennis Edaakie's work. Dennis and Nancy Edaakie started making jewelry in 1965 and have become known for finely detailed bird imagery on pieces made in the overlay inlay technique. Dennis's father, Merle Edaakie, did stonework for trader C. G. Wallace. 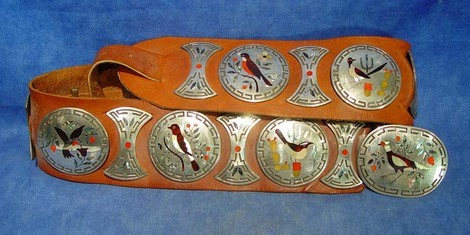 In 1970, at the urging of traders Ruth and Leon Ingram, Dennis and Nancy first produced inlay jewelry bearing images of birds. Overlay inlay is similar to Hopi overlay. In both methods, one piece of silver with a cut-out pattern is overlaid on another piece of the same size and shape. In the Hopi technique the bottom layer is darkened so that the cut-out areas contrast with the polished silver of the top layer. In the Zuni overlay inlay technique, mosaic stonework fills the blanks, forming a brilliantly colored counterpoint to the monochromatic silver. Beginning in the late 1970s, Dennis and Nancy further innovated on the overlay technique through the use of gold, as opposed to silver.